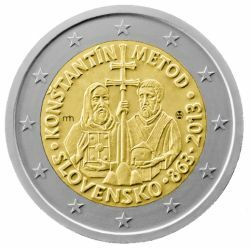 Slovakia, responding to requests from some fellow eurozone countries, has removed the halos from a €2 coin commemorating the 1,150th anniversary of the arrival of Saints Cyril and Methodius in Moravia. Slovakia, a eurozone member since 2009, will start circulating the coin next year to mark the arrival of Saints Cyril and Methodius to Great Moravia and Panonia, which was part of modern Slovakia. Eurozone countries are allowed to mint commemorative coins once every year under EU rules. The image on the back of the commemorative coin, however, must be accepted by the remaining eurozone members and the European Commission. Cyril and Methodius were brothers, born in Thessaloniki at the beginning of the 9th century, who created the Glagolitic and then the Cyrillic alphabets with the aim to have the Bible and other texts translated into Slavic languages [more]. Cyril died in 869 and Methodius in 885. They were soon canonised as saints, with Saints Cyril and Methodius Day being celebrated on 24 May to mark the anniversary of Cyril’s death (see background). Cyril and Methodius were also declared patrons of Europe in 1980 by Pope John Paul II. In Bulgaria, the only EU country at present to use the Cyrillic alphabet, 24 May is a public holiday, called “Bulgarian Education and Culture, and Slavonic Literature Day”. Slovakia agreed to remove the halo despite Cyril and Methodius' undisputed status as saints. "Under EU rules, when designing the national side of a euro coin, Member States are required to take into account that the coins will circulate throughout the whole eurozone, and in that context, proposed designs are shared in advance with other Member States so that they can provide any comments they deem appropriate," the Commission said in a statement. The Commission acknowledged that some members states objected to the coin, adding that Slovakia submitted a slightly amended design, "which has now been approved by the [EU] Council of Ministers." If the motivation of the unnamed member states was to remove religious symbols from the design, they did not entirely succeed. Cyril and Methodius hold a Christian double cross, standing on the middle peak of a mountain with three peaks. The double cross and the three peaks are the main elements of the coat of arms of Slovakia and feature on the regular Slovak euro coins. The revamped design has been met with unease by the Bulgarian press. During Communism, painters and sculptors were requested by the authorities to portray Cyril and Methodius without sanctity halos.